GTM Research explains smart grid to the public in Fortune Magazine. Large-scale efforts are underway to modernize the U.S. electric grid by adding high-speed communications and transforming the infrastructure into a “networked grid” or an “internet for energy.” This so-called smart grid will not only bring new communication capabilities to mission-critical grid devices and end-user appliances in order to optimize energy efficiency, reliability and security, but will also serve as the enabling platform to plug in the next generation on clean energy technologies, such as rooftop solar systems, wind farms and electric vehicles. Surprisingly, the revolution in information technologies (IT) that has transformed other high-tech industries (such as desktop computing, enterprise networking, wireless telecommunications) has yet to transform the electric power business, arguably one of the farthest-reaching and most extensive “networks” in existence. The smart grid, in large part, sits at the intersection of energy, IT and telecommunications markets. As such, a great number of the leading players from IT and telecom industries, such as Cisco, Oracle, IBM, Google, Microsoft, Verizon, and AT&T are now transitioning into the energy sector. 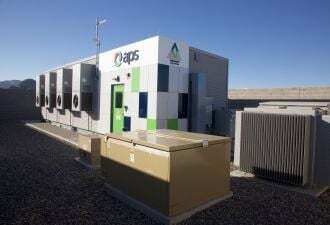 Meanwhile, young companies and startups with names like Silver Spring Networks, SmartSynch and Trilliant continue to gain traction, reinvigorating the electric power industry with new technologies and services. It’s no wonder. The amount of opportunity inherent in the push to upgrade an industry that has lagged behind in both R&D and IT investment -- and which, by the way, generates roughly $350 billion in annual revenue in the U.S. alone -- is substantial. Furthermore, it is interesting to note that politically, the smart grid has great traction on both sides of the aisle. The right, concerned with our dependency on foreign oil, correctly views investments in smart grid as foundational towards transitioning the transportation sector to electricity. The left, concerned with the dangers of climate change, properly understands that smart grid represents the largest single information technology investment that can be made to reduce carbon emissions. Despite a general lack of public awareness of the grid’s central role in enabling our nation’s economy, business and political leaders, including the Obama Administration, have been increasingly advocating and funding investments in smart grid to drive GDP and give the U.S. a competitive advantage. These epic infrastructure investments are seen as analogous to the ones made under the direction of President Eisenhower in creating the interstate highway system, the economic benefits of which are still being realized to this day. However, the U.S. is hardly alone in promoting smart grid as an economic growth engine; virtually every major economy is now either piloting or deploying smart grid technologies, and it’s now understood that you can not run a digital 21st century economy on a 20th century grid. While today’s grid remains largely based on the same architecture of its forefathers, Edison, Telsa and Westinghouse, where the majority of power is generated at large, centralized fossil-fuel-burning power plants, tomorrow’s grid will allow for greater amounts of distributed generation and storage, giving consumers the opportunity to produce their own clean energy, and to sell any excesses back to the grid. While today’s distribution grids, lacking real-time visibility and control, are largely running blind and consequently costing the U.S. economy approximately $100 billion to $150 billion each year in power outages, tomorrow’s grid, much like the human body’s own nervous system, will have sensory intelligence embedded throughout, giving the grid the ability to anticipate disruptions, and even to self-heal. 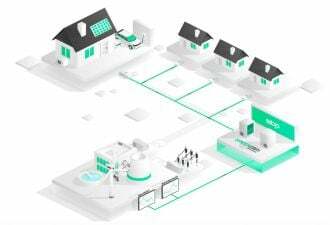 Lastly, and perhaps most welcomed, is the manner in which smart grid will completely transform end-users’ relationship to their energy use, empowering consumers with real-time data and analytics via in-home energy management systems and web portals, taking us closer to the age of The Jetsons. Over the next five years, consumers will interact with the first wave of smart appliances, lightning systems and management systems, using “set-it-and-forget-it" technologies to automate their homes and businesses for energy savings and other preferences, such as increased levels of green energy. In phase two, which will unfold over the next 10-20 years, consumers are expected to deploy the next wave of home energy “apps,” such as community “micro-grids” able to generate 100% of their own power over certain periods, while trading energy for profit during other periods, to electric vehicles able to determine the most affordable hour of the day to charge their own batteries. Meanwhile, an immeasurable number of innovations and applications yet to be invented are waiting for our next great generation to bring them forth. 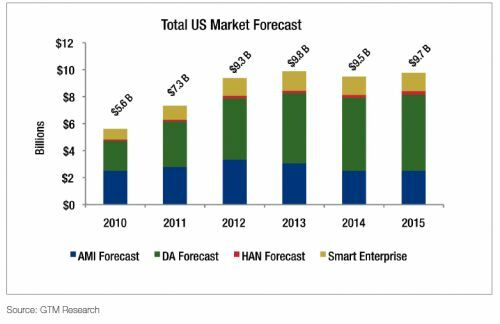 The following chart shows the projected growth of the smart grid market over the next five years. A version of the above article, written by David Leeds, appeared in the November 15th edition of Fortune magazine. 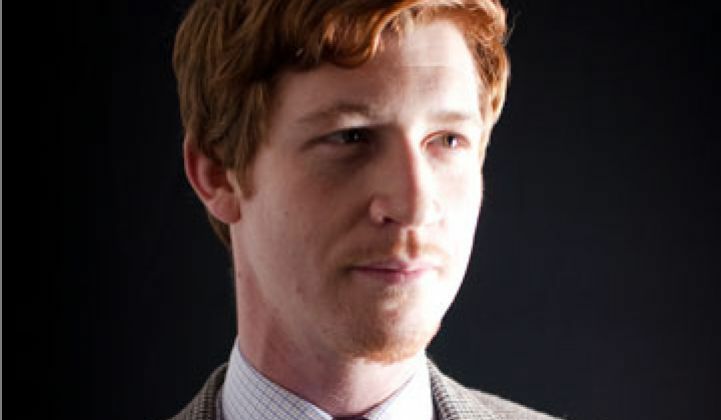 More data can be found in David Leeds' recent report, U.S. Smart Grid Market Forecast 2010-2015.